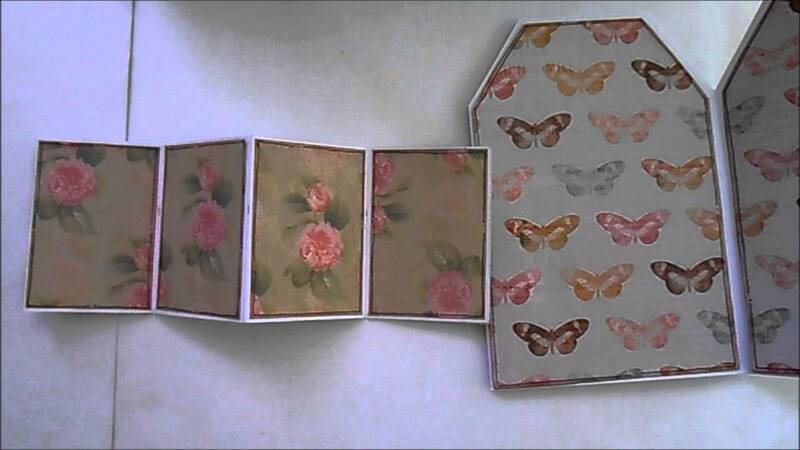 Learn how to make a kinetic card! Separate the movers from the shakers with Marie Jones’s fabulous kinetic shutter card! Kinetic cards, which means meaning ‘causing motion’, have been around for a while and can look complicated to make, there are all different kinds, we’re focusing today on making a kinetic shutter card. It’s fun to open and close and you can add it to your portfolio of card designs! 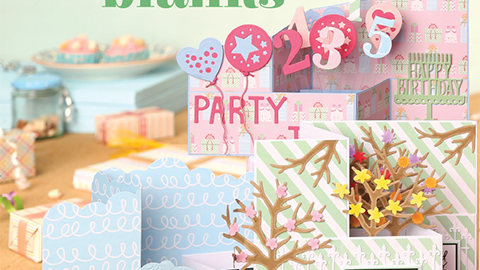 Add your own toppers, images or embellishments to adapt your cards for any occasion. 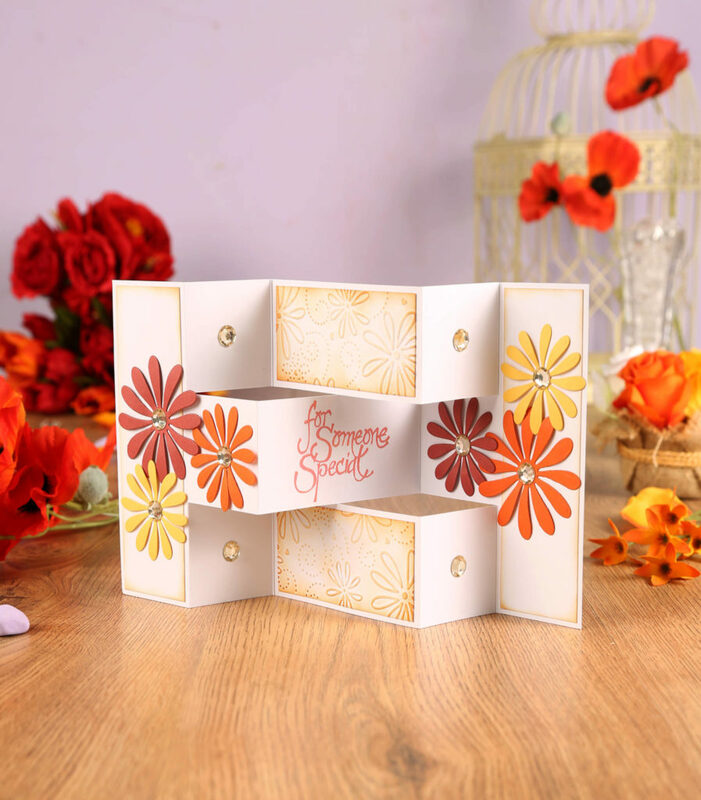 Kinetic shutter cards are easy and fun to make, and add an extra element to your card designs. 1 Cut a 30x15cm piece of white cardstock. Mark with a pencil at 5cm, 10cm, 20cm and 25cm on the long edges; and 5cm and 10cm on the short edges. 2 Join the marks with faint pencil lines and use the template shown above as a guide for where to cut and where to score. Fold and burnish the score lines to create the shutter card blank. 3 Cut two 9.5×4.5cm pieces of white cardstock. 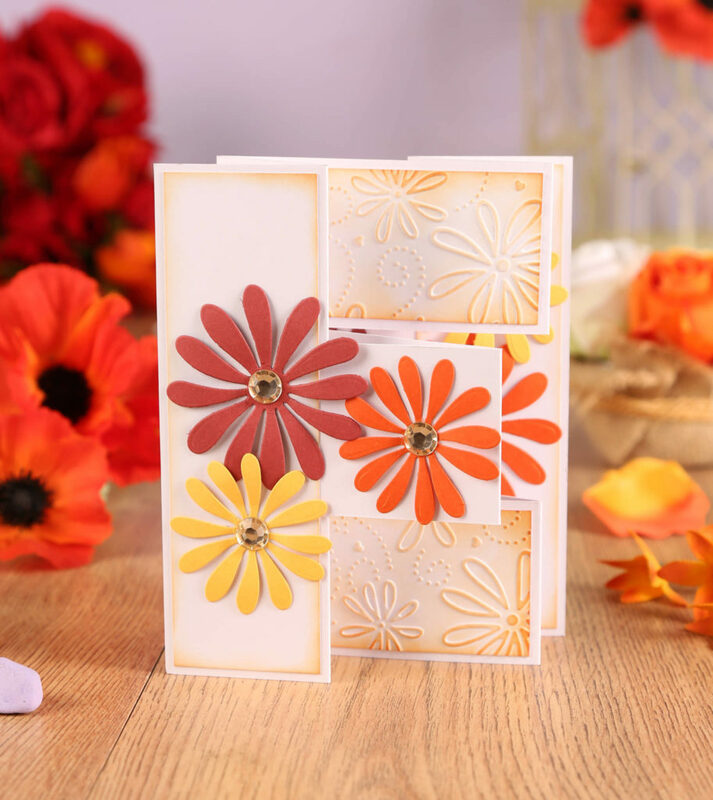 Emboss using the Daisy and Swirl folder and highlight the raised pattern using Rusty Hinge ink. Attach to the top and bottom centre panels as shown. 4 Cut two 4.5×14.5cm pieces of white cardstock, ink the edges using Rusty Hinge ink and attach to the end panels as shown. 5 Lay the card blank flat and use Rocket Red Gold ink to stamp the sentiment in the centre panel. 6 Die-cut flowers from coloured cardstock, shape the petals and adhere to the side panels as shown. Embellish the card front using gems to finish.